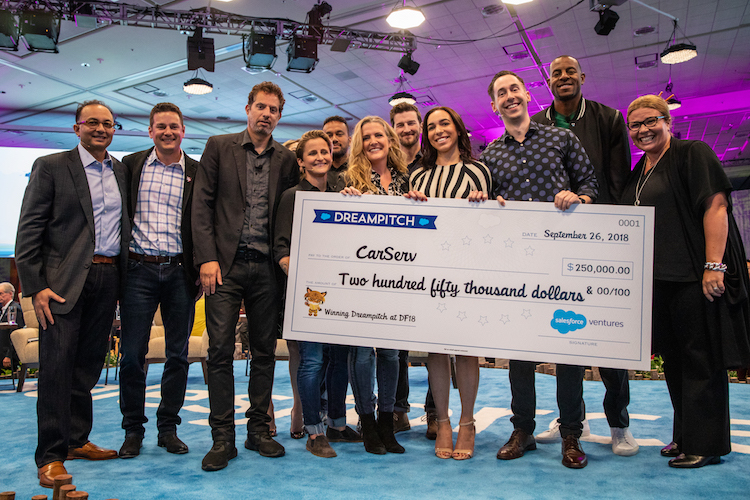 CarServ is proud to announce that it won Dreampitch at Dreamforce 2018, a competition designed to recognize startups that have built their business on the Salesforce Platform. CarServ was one of three finalists selected for the final stage to come to Dreamforce, Salesforce’s annual conference and the largest software conference in the world. 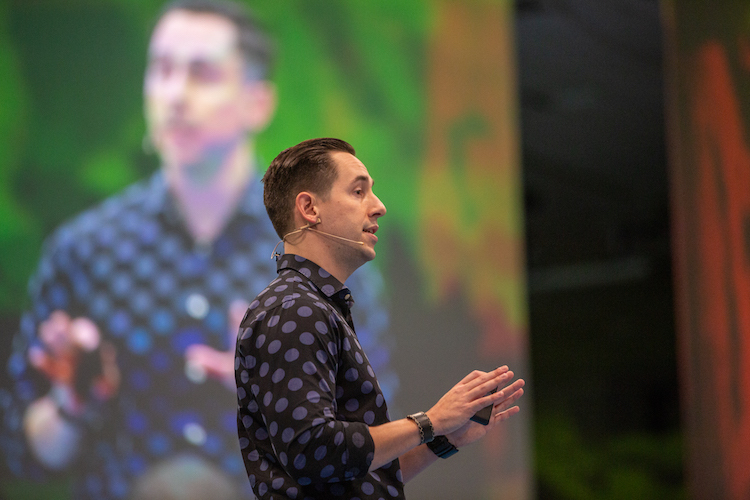 CEO Mars Mundy pitched CarServ on the main stage at Dreamforce, in front of thousands of attendees and a panel of expert judges made up of industry leaders and business experts. The judges selected CarServ as the winner to receive a $250,000 investment from Salesforce Ventures, Salesforce’s corporate investment group. CarServ’s solution helps auto repair facilities increase revenue and profitability while providing a high-quality experience for customers—all based on better data around the repair process. With CarServ, repair facilities can utilize mobile devices to make their workflow and customer engagement more efficient. CarServ is an official partner of Lyft, giving CarServ facilities easy access to an on-demand courtesy fleet. This year’s Dreampitch was sponsored by T-Mobile for Business. As the Un-carrier, T-Mobile’s core philosophy is based on challenging convention and disrupting business norms to address consumer pain points. T-Mobile for Business is proud to bring Dreampitch to today’s entrepreneurs as they challenge the status quo and create a brighter future. Dreampitch at Dreamforce 2018 is a competition designed to recognize top startups whose products are built on the Salesforce Platform. Finalists presented their business pitch live to a panel of judges at Dreamforce. The CarServ operating system provides an end-to-end software solution powered by machine learning that will allow service centers to cut costs, improve efficiency and maximize customer satisfaction. CarServ’s partnership with Lyft allows repair centers to offer a convenient and affordable courtesy vehicle option for their customers. CarServ wants to make vehicle service a consistent, high-quality experience for customers because it is our belief that business models which unify consumer experiences will dominate the future of mobility. For more information about CarServ, visit carserv.com. CarServ, the operating system for auto repair, is proud to announce a partnership with Lyft, the fastest growing rideshare company in the US. Together the two companies will combine CarServ’s optimized repair shop workflow and enhanced shop customer experience with Lyft’s mission to improve people’s lives with the world’s best transportation. The partnership will simplify the repair experience and increase convenience for vehicle owners. Repair facilities using CarServ can easily request Lyft rides for their customers. The repair facilities can get customers in and out of the door faster while offering their customers a valuable service. CarServ is powered by machine learning in order to drive efficiency at repair facilities. Our focus is a consistent, high-quality experience for customers; all based on better data and insight around the repair process. CarServ and Lyft now offer a unified repair and ridesharing experience for consumers. By partnering with Lyft, CarServ service facilities can stop purchasing and maintaining courtesy vehicles, and save money by using Lyft for courtesy rides. These repair facilities can then use those cost savings to devote more resources to fixing more cars, faster. Better operational and customer service can drive revenue growth. The Carserv operating system provides an end-to-end solution powered by machine learning that will allow service centers to cut costs, improve efficiency and maximize customer satisfaction. CarServ wants to make vehicle service a consistent, high-quality experience for customers because it is our belief that business models which unify consumer experiences will dominate the future of mobility. CarServ was proud to be included among the 50 startups presenting to North American International Automotive Show (NAIAS) in Detroit. We were fortunate to be able to form some promising business development relationships and introduce our software platform to a broad audience. As part of NAIAS, our CEO Mars Mundy was asked to do an interview with CNBC. We are thrilled with the reception for CarServ coming out of NAIAS and our first opportunity for international press coverage. We look forward to more in the future! With the emergence of parts procurement systems, many shops are changing the way that they order supplies. While some are making the move directly because their DRP agreements required it or they joined an OEM certification program, all of them are implementing a best practice that can increase efficiency. According to a FenderBender.com study, in 2015 as many as 52% of shops still relied on phone calls, emails and faxes to order parts. However, those that have transitioned have seen improvement in the accuracy and efficiency of parts deliveries. These improvements have led to owners seeing a boost in profitability and the efficiency of their shops. While the software of different parts procurement systems may function differently, most allow employees to quickly contact multiple suppliers. Some systems allow workers to contact more than one supplier simultaneously. This allows you to find and compare parts faster and more efficiently than traditional methods. This efficiency can result in significant time savings for shops. The efficiency these systems offer make their implementation a clear best practice for every shop moving forward. Greetings, and welcome back to the CarServ blog! My name is Mars Mundy, and I am the founder and CEO of CarServ. CarServ is a software as a service (SaaS) startup based in Austin, TX. We are a Techstars company (Austin 2016), a fact of which we are immensely proud! At CarServ we help automotive repair shops and service centers run their shops, increase customer satisfaction and retention. You are probably wondering how we do this. Well, the short answer is that we provide a real-time, dynamic shop management and communication platform for these businesses to manage the back office as well as the entire customer communication process during and after the repair. In essence we take a process that currently involves 3-5 pieces of unintegrated software and an excessive amount of phone calls and we transform it using our platform. CarServ can do everything from telling a shop what parts they need, to ordering those parts, building an estimate, texting or emailing that to a customer, and notifying the shop when the customer approves the work.